Department of Information and Communications Engineering, Myongji University, Yongin 449-728, South Korea. Different designs have been presented to achieve high concentration and uniformity for the concentrated photovoltaic (CPV) system. Most of the designs have issues of low efficiency in terms of irradiance uniformity. To this end, we present a design methodology to increase irradiance uniformity over solar cell. The system consists of an eight-fold Fresnel lens as a primary optical element (POE) and an optical lens, which consists of eight parts, as a secondary optical element (SOE). Sunlight is focused through the POE and then light is spread over cell through the SOE. In the design, maximum sunlight is passed over cell by minimizing losses. Results have shown that the proposed CPV design gives good irradiance uniformity. The concentration module based on this novel design is a promising option for the development of a cost-effective photovoltaic solar energy generation. Photovoltaic power is a clean energy that is directly transformed from solar energy. It helps to solve the environmental problem by reducing substantially the emission of CO2. However, the cost of the concentrated photovoltaic (CPV) is still too high to compete with the traditional power. The main cost of the CPV systems is from the solar cell. To overcome cost for the CPV system, new designs are needed to use of less semiconductor material. One of the solutions is to collect sunlight from a large surface area and focus it onto a small area. In the CPV systems, solar radiation is collected through solar concentrators that allow decreasing the cell area proportionally to the concentration factor, C, where C is the ratio between the primary concentrator area and that of the cell . A higher concentration factor can considerably reduce the cost of photovoltaic energy generation . To minimizing energy cost of the system, low-cost optical design with high efficiency and the fewest elements is required. The CPV technology promises not only to reduce the cost of the overall system, but also increases the amount of power produced . A concentration system consists of three parts: focusing optics, solar tracker, and receiver. The focusing optics allows the sunlight concentration on the receiver. Since the concentration system requires direct sunlight, the focusing optics and the receiver require the use of a sun tracker to optimize the incident radiation. Solar concentrators that are used to collect solar radiation over cell include: Fresnel lens , parabolic concentrator , compound parabolic concentrator (CPC) , parabolic trough , v-groove mirrors , refractive prism , and luminescent glass . In CPV systems, point focus Fresnel lenses are generally used. To concentrate the best radiation over cell, which has particular dimensions, a secondary optics, which includes lens or reflector, is used. The overall performance of the CPV system depends on how effectively each of these elements performs individually and collectively. Non-uniform irradiance is a well-known problem in CPV systems . For the CPV system, two types of non-uniformity are caused in cell . 1) Some regions of the cell are excessively illuminated that generate huge currents and get heated. Likewise, some areas are rarely illuminated because of non-uniform illumination, which decreases the electrical output of the cell. As a result, some areas of the cell do not operate. 2) Some parts of the cell are over shadowed that cause the whole series generator to stop supplying energy. As a result, the electrical energy produced in the illuminated cell is dissipated in the cell, which is not illuminated, and this cell is heated. The non-uniform illumination produced by the use of concentrator increases the cell temperature, cell resistance, and lowers the efﬁciency. Almost 40% of energy is lost compared to what it should perform ideally throughout the process . Nonimaging optics helps to solve this problem by adopting efficient techniques to achieve the maximum radiation with uniform illumination. Many designs for the CPV systems have been proposed since the birth of nonimaging optics in the 1970s by Winston . In nonimaging optics, nonimaging concentrators (e.g., CPC) were introduced to achieve high concentration, especially for solar energy applications. Nonimaing concentrators were used to achieve high concentration for improving performance (efficiency) and the economics by reducing cost of the system. At higher and higher concentrations, the relative cost of the energy per unit aperture became small. Therefore, we used nonimaging concentrator for the CPV system to provide high concentration with uniform illumination. Practically, nonimaging concentrators have high efficiency in terms of concentration than imaging concentrators. Therefore, nonimaging concentrators have been widely used for solar thermal and CPV applications. In CPV systems, several types of optical elements are utilized. Fresnel lens has gained popularity due to them being easily manageable and widely available for rapid manufacturing compared to other concentrators (e.g., the parabolic reflector) . One of the purposes of current research is to design a nonimaging concentrator to achieve high concentration, which can be applied in CPV technology. A primary optical element (POE) consists of eight-folds Fresnel lens, and a secondary optical element (SOE) consists of eight spherical and one cylindrical parts to achieve uniform illumination. We perform the integration with an eight-unit array: POE and SOE are divided in eight symmetric parts, with each eighth of the POE corresponding to an eighth of the SOE. As cell requires uniform illumination, two stage concentrated is a better choice. One of the reasons to use eight-fold Fresnel lens is to remove chromatic aberration. Overall, the new design improves efficiency of the CPV system. In , a plastic prismatic structure of CPV system was demonstrated. In the design, sunlight was concentrated through prisms and then light was directed over cell. Based on the dispersive behavior of the employed material for the cell, light was split into its spectral component. A certain spectrum of sunlight was spread on the corresponding part of the cell to efficiently generate electricity. However, it is difficult to spread spectrum of light uniformly at specific region of the cell. A domed shape Fresnel-based CPV system was experimented in . As the solar spectrum and irradiation are not stable in some countries (e.g., Japan), it causes chromatic aberration. They minimized the chromatic aberration in the CPV system. The system was prepared for the wet environment, and they achieved array efficacy of 25.8%. In addition, a stationary CPV system with four-stage concentration was designed and demonstrated . Two flat Fresnel lenses were used to concentrate light toward the compound parabolic concentrator (CPC) and then light is further focused over cell through a glass lens. This system was used to achieve high concentration for the cell. Recent problem is to achieve high-uniformity, which was not discussed in detail. In , a nonimaging concentrator-based CPV system was demonstrated. They developed a primary concentrator lens, which concentrated light by Total Internal Reflection (TIR) to reduce focal length of the lens. The grooves of the lens were on downside while flat surface on the upper side. SOE was used to make the light uniform over cell. An optical concentration of 250x was optimized in the system. Furthermore, a CPV systems, which contained two optical elements (the Fresnel lens and the SOE) was designed and manufactured . Fresnel lens had four identical folds, and SOE was divided into four equal parts. Each part of the Fresnel lens focused light onto the required part of the SOE. They achieved optical efficiency of 83.5%. Overall, light uniformity over the cell was improved. Furthermore, a design of two stage concentrator, which used reflectors to reflect uniform light over cell, was presented . Edge ray principle was used to verify the system. In this design, primary reflectors had sun-tracking module while secondary reflectors were stationary. Thus, the precision of arrangements for multi-mirrors should be controlled strictly. One drawback of using primary and secondary reflectors is the shadow, but they solved this problem by making uniform illumination over cell using non-imaging optics. To increase efficiency of the CPV system, different SOEs (e.g., domed shape, kaleidoscope, etc.) were used [21,22]. The main issues of the CPV system are illumination uniformity over cell and acceptance angle of the concentrator. Acceptance angle needs to be increased to get rid of sun-tracking module, and illumination uniformity needs to be enhanced to use the cell efficiently. As a result, cost of the system can be reduces by solving both issues. Since efficiency of the cell also depends on the reflectivity on the cell’s surface. A design was presented to recover this reflectivity where the reflected light was redirected over the cell . In the SOE, a reflective surface was made for this purpose. The reflective part of the SOE was made of glass and reflective coating that made the system costly. In [24,25], we analyzed losses and improved two light concentration systems using a parabolic reflector and a Fresnel lens. During the development, the efficiency of the system was improved via uniform and collimated illumination on the receiver. In each design, SOE was used to produce uniform illumination. The parabolic dish and Fresnel lens had a diameter of 320 mm and 300 mm, respectively, and size of the receiver was 14.4×14.4 mm. Both systems were demonstrated through simulation and real experiments for daylighting. Development of these two systems was presented in  where two designs were proposed for the parabolic trough and the linear Fresnel lens. For the parabolic trough, sunlight was concentrated and focused toward the parabolic reflector, and then collimated light is transmitted toward the trough compound parabolic concentrator (CPC). For the linear Fresnel lens, concentrated light is collimated through the plano-concave lens and then light enters into the trough CPC. The trough CPC was used to achieve high concentration for the receiver. Both designs were analyzed for daylighting to transmit light in the interior. However, these four designs that are described above can be used for the CPV system. Furthermore, we achieved high concentration of sunlight through heliostats where thirteen heliostats were arranges into circular arcs . Highly concentrated sunlight was collected into light-pipe to use it for daylighting and photovoltaic. In this research, we present a simulation study of the proposed CPV design. LightTools®, which is a well-known, optical-simulation tool [24–27], is used to design the optical components (eight-fold Fresnel lens and SOE) of the CPV system, analyze the efficiency of the system, which includes light losses due to optical components and illumination uniformity. Almost all losses (i.e. due to reflection and the transmittance of materials) are considered in the simulation to analyze the performance of the system efficiently. The remainder of the paper is organized in the following manner. 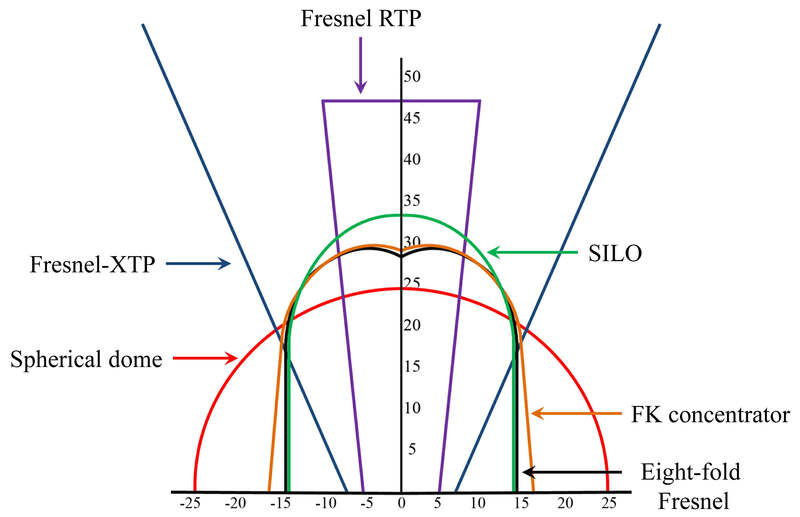 Section 2 describes the proposed CPV system using an eight-fold Fresnel lens, and the detailed description of uniform irradiance is discussed. The complete study, involving the simulation, the implementation of the systems, and the evaluation of the results are presented in Section 3. Finally, brief concluding remarks and future work are included in Section 4. Different techniques have been presented in the literature to capture sunlight through solar concentrators. In concentration systems, it is preferred to have a minimum number of modules with an effective output while remaining cost-effective. The idea behind the system is to capture high-intensity sunlight and then focus it over cell. Direct sunlight was focused through the POE. The light went through the SOE and then the light illuminated the cell. Previously, it was difficult to achieve a high concentration of light with high-uniformity. The effect of non-uniformity can be found in all the types of CPV systems. There is a need to design optical elements to achieve high uniformity. To this end, we propose a design to achieve uniform illumination over cell using two optical elements. In the proposed design, there were two optical elements: the POE and the SOE. The POE was a Fresnel lens, which had eight-folds with different focal points. Layout of the Fresnel lens is shown in Fig. 1. The SOE had eight parts where each part corresponds to each focal point of the POE. Design of the SOE, which was made of spherical and cylindrical parts, is shown in Fig. 2. If we made SOE with single spherical and cylindrical parts, the rays were not uniform, as shown in Fig. 3(a) and (b). We designed a spherical lens to spread uniform rays from each focal point of the POE over cell. As shown in Fig. 3(c), all rays are distributed over cell uniformly. 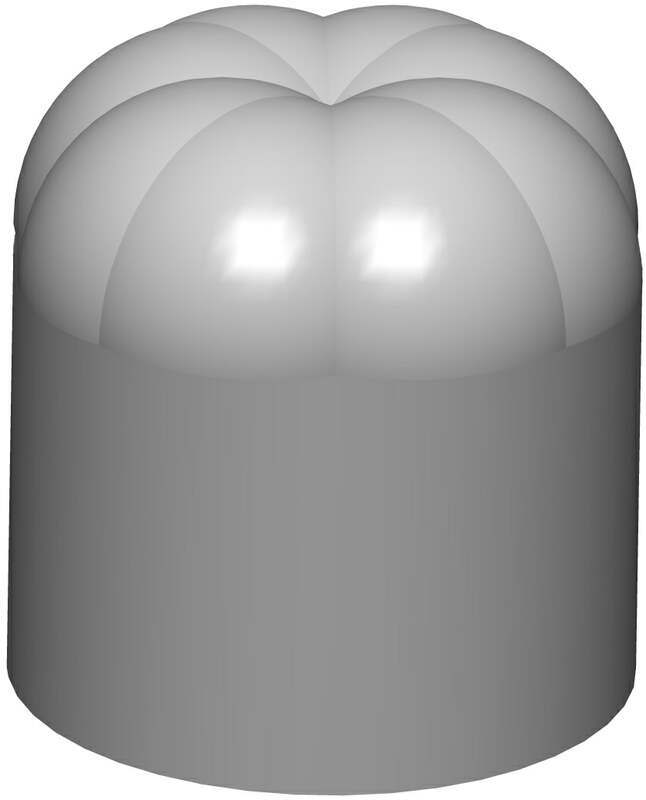 The proposed SOE was designed with eight spherical and single cylindrical parts, as shown in Fig. 3(d). Fig. 1. 3D view of eight-fold Fresnel lens. Fig. 2. SOE made by spherical and cylindrical parts. Fig. 3. Ray-tracing of the SOE using domed shape lens, which shows nonuniform distribution of rays, for the (a) normal Fresnel lens (b) eight-fold Fresnel lens and spherical lens, which gives uniform distribution of rays for the eight-fold Fresnel lens, (c) single lens (d) eight lenses. where f is the focal length and D is the diameter of the Fresnel lens. In our case, the f-number was 1.0. The SOE had a size of 28×29 mm. The material used was BK7 with a refractive index of 1.52. Different parameters for the POE and SOE are mentioned in Table 1. In Fig. 4, a comparison between the proposed SOE and previous SOEs is illustrated where design and size of the SOEs is shown . Size of the cell for each concentrator is mentioned in . Table 1. Different parameters of hardware modules. Fig. 4. Layout of the SOEs of the Fresnel-based concentrators. All these concentrators have the same the same acceptance angle (α = ± 1 deg). where Cg is the geometric concentration, defined as the ratio of concentrator aperture area to cell area, and α is the acceptance angel, which is the incidence angle at which the concentrator collects 90% of the on-axis power. To calculate the CAP for the proposed concentrator, we used parallel rays at various incident angles and determined the acceptance angle α, which is ±1.5°. The CAP for a geometric concentration (Cg = 625x) was determined using Eq. (3) (CAP≈0.65). LightTools® was used to implement and simulate the proposed CPV system. All modules such as Fresnel lens and secondary optics were designed in the software. In the CPV system, one of the important components is the dual axis sun-tracking module, which makes sunlight perpendicular to the entry aperture of the concentrator. Solar energy system should be designed according to its location and seasonal changes to take advantage of the sun as much as possible. In present research, it was presumed that the system had a dual axis sun-tracking module to achieve direct sunlight all day. Collimated light was needed to test the CPV system. A light source was designed to produce collimated light. After designing all the modules, the results were obtained through ray-tracing. As we had POE, which produced eight focal points, the SOE was designed to merge all rays over the cell. Size of the POE was 300×300 mm with focal length of 300 mm. The upper part of the SOE was made of spherical shape, and the lower part contained a cylindrical shape. SOE had height and width of 29 and 28 mm, respectively. The acceptance angel of the current CPV system was 1 degree, and size of the solar cell was 14×14 mm. The edge-ray mapping of an ideal CPV system is illustrated in Fig. 5(a). All light within the acceptance angel of the concentrator is spread over cell. 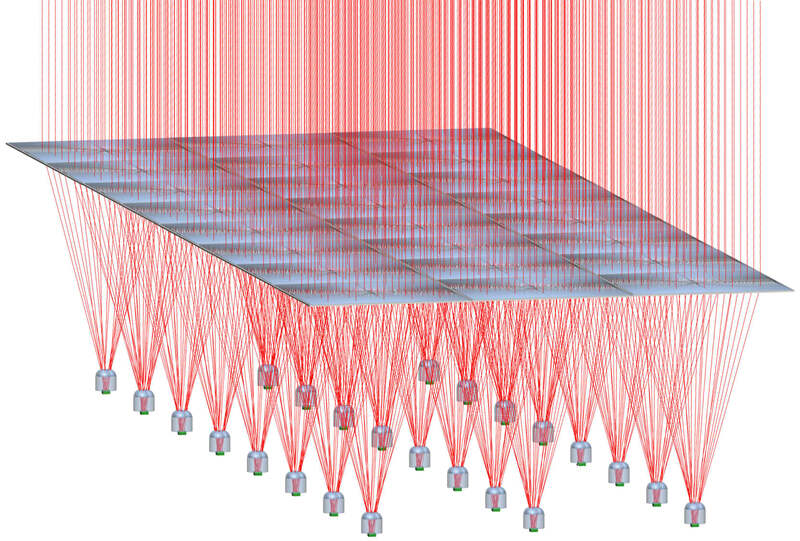 Layout of the proposed CPV system under ray-tracing simulation is shown in Fig. 5(b). The POE focused incident rays on the SOE surface and then SOE distributed all these rays over cell uniformly. To evaluate the system, irradiance distribution of the CPV system was achieved (Fig. 6) when the sun is on-axis with Direct Normal Irradiance (DNI) of 850 W/m2. It can be seen that the eight-fold Fresnel lens with the SOE gives uniform irradiance distribution over cell. Fig. 5. (a) Schematic showing edge-ray mapping in an ideal Fresnel concentrator. (b) Layout of the eight-fold Fresnel-based CPV system with ray-tracing sowing how rays uniformly illuminated the cell. Fig. 6. 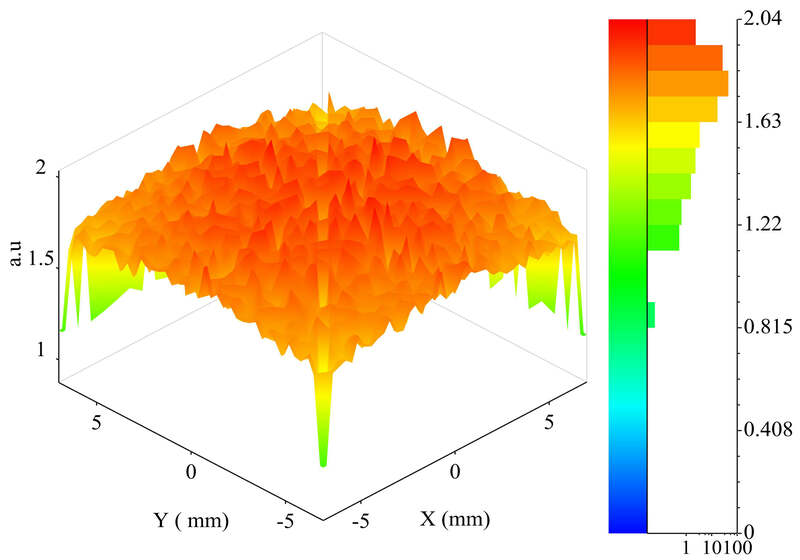 Irradiance distribution on the solar cell for the eight-fold Fresnel concentrator. As we used PMMA and silicon for the POE and SOE, respectively, both materials had similar transmission efficiency over the visible spectrum, while silicon was advantageous at infrared . It was found that PMMA showed stronger refracting power than silicone . The proposed design had optical surfaces that were very similar to a classical CPV design. In these designs, a flat Fresnel lens and a glass dome over the cell was used. Thus, the proposed POE and SOE can be manufactured with the same techniques (continuous roll embossing, hot embossing, compression molding, etc. for the POE; glass molding for the SOE) . It is concluded that the production cost of the system is similar as that of the traditional methods. Fig. 7. Array level layout of the eight-fold Fresnel-based CPV system. We proposed an efficient approach for the CPV system to increase irradiance uniformity. The two-stage concentration system included light focusing and distribution. The light was focused through the POE and then light was spread over cell through the SOE. Previously, it was difficult to achieve high concentration with uniform irradiance. We solved uniform irradiance problem using the eight-fold Fresnel lens with the SOE. Optical-simulation tool was used to verify the efficiency of the system. The results have shown that the efficiency of the system in terms of uniformity is better than that of traditional systems. The proposed concentrator is in our opinion an excellent candidate to make cost-effective CPV system at single cell level and array level due to the ease in manageability, the applicability of rapid manufacturing, and the good efficiency in terms of irradiance uniformity. An example of array level design for the CPV system is shown in Fig. 7. To compete with other energy sources, it is essential for the CPV system to decrease the production cost and increase the energy collection and power production. The recent advances in multi-junction solar cells are a promising start to reach a higher power production, and the eight-fold Fresnel concentrator is an excellent candidate for them, due to its high acceptance angle and excellent irradiance distribution. It is able to give same uniformity for three junctions at two POE temperature, 20°C and 45°C . In the future, we will improve performance of the system by designing POE with short focal length, which is preferred for the hardware implementation. The research is in the early stages of development of the system, and it is currently underway to verify its energy generation benefits. R. Winston, J. C. Mi˜nano, and P. Ben´ıtez, Nonimaging Optics, Elsevier-Academic Press, New York, NY, USA, 2005. W. T. Welford, R. Winston, The optics of nonimaging concentrators: light and solar energy, Academic Press, New York, 1978. L. L. C. Chen, Stationary photovoltaic array module design for solar electric power generation systems. US Patent 6,653,551; 2003. P. Benitez and J. C. Miñano, Concentrator Optics for the next generation photovoltaics, Chap. 13 of A. Marti & A. Luque. Next Generation Photovoltaics: High Efficiency through Full Spectrum Utilization, Taylor & Francis, CRC Press, London, 2004.